Across the street from our hotel is the Arasta Bazaar. We learn a contradiction: no means yes. It takes us several days to learn better methods of saying no to salesmen. We are just hours in Istanbul and we have already learned that we can't browse. Just casting our eyes toward the merchandise, brings the storeowner rushing to our side with, "How can I help you spend your money?" The top floor restaurant of our hotel is closed for the season. 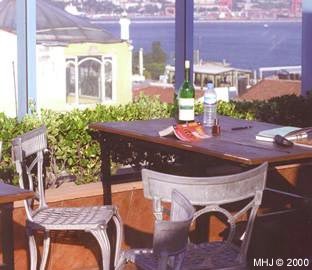 We had chosen this accommodation based on the lovely photo on a website of diners on the roof. We soon change our disappointment into our advantage, as we claim this spacious area with empty tables and chairs as our very own private roof top patio. We enjoy the views across the Sea of Marmara, with all of the great variety of boats a busy harbor can command. On the other side of our patio, we can view the busy bazaar and restaurant across the street, and at night we have free admission to the restaurant's stage show. At other times of the day, when we are tourist weary, we use our patio as a refuge to just be quiet for a while: read a little, sip a glass of wine, chose a restaurant from our guide book for dinner. After settling in the first day, we dine on the first floor garden cafe of our hotel. Across the street looms the Blue Mosque. We are dazzled. It is larger than we expect and it is literally sitting at our feet. We dine on our first Turkish meal of tulip meatballs and lamb kebob, sitting on the same side of the table so that we can enjoy our view. Is it was worth coming this far to see this sight? You betcha. While we eat, the sound and light show at the Mosque commences, drowning out our strumming musician at the restaurant. We knew there would be a show, but in our living-for-the-moment attitude, we had forgotten, and therefore were surprised. We were amused when the sound part was all in German, making the story coming loudly from the speakers sound incongruous to the visual sight. We retire to our rooftop patio now dark except for the glow of lights from the Mosque. Four musicians play accordions, viola, and a reed instrument, while a Dervish whirls with his head at a tilt creating the look of a malformed turban. The lights bathe his white billowing dress in a mystical blue, the folds in black. At the end, he bows to conclude his performance. 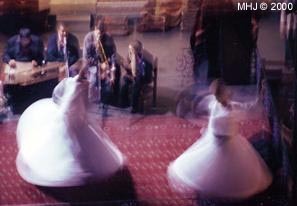 A second song is danced by two Dervishes; they bow to each other. There is no contradiction in my expectations here: the dance and music are as exotic and haunting as imagined. On the last morning in Istanbul, the first call to prayer started at 5:30 as it has every day during our visit. The mezzuin's song is powerful, not only in the intensity of the loudspeaker broadcast, but also its lyrical mystery. Even though he sings in a language I do not understand, I can tell from day to day the differences between songs. I startle at the strong voice and hold my breath when he inhales to start another phrase. I listen to every word and tone. Because the Blue Mosque is so near to our open bedroom window, we feel that we are right there with him or he here with us. During the four other calls during the day, we listen to echoing answers from other mosques. Hearing these reverberations are as exotic as we expect. What is unexpected is the reactions within oneself. Because my work relies on using visual skills, it is a pleasure to explore a sharpening of the auditory sense. The call to prayer and my reaction to it has been my favorite part of Istanbul. See a published paragraph of another story, In Search of Truffles, in Her Fork in the Road, published 2001 by Traveler's Tales.